Only Kobe Bryant would try to single-handedly upstage the NFL on Championship Sunday. And he was competing against the Lakers' record holder, Elgin Baylor, who had 71; David Robinson, also 71; David Thompson, 73; and Wilt, 72, 73, 73, 78 and 100. And he beat them all. Except for Wilt. On one night. Too bad the Lakers don't play on Super Sunday. I'd love to see Kobe go for Wilt's record, too. En route to an 81-point performance, Kobe Bryant takes it past Matt Bonner. Bryant's season low this year came against the Raptors, an 11-point night in a 102-91 win in Toronto on Dec. 7. A scout told me this week that Philly's defensive problems begin with Allen Iverson and end with Chris Webber. He said the fact that A.I. applies no pressure whatsoever when opposing point guards bring the ball up court allows teams to get into their offense too easily. Then, C-Webb doesn't front the post, so entry passes down low are pudding. Teams can also pick-and-roll C-Webb to death because of his mobility problems. In the middle of the A.I./C-Webb spectrum is Kyle Korver, who gets toasted nightly by whichever two or three-man Andre Iguodala is not guarding. 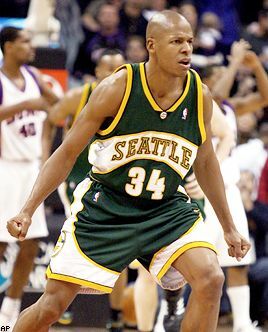 After sending the game into overtime, Ray Allen got the game-winner for the Sonics in a 152-149 win over the Suns in double OT. Kobe Bryant, Lakers guard: That's 81. Eight-one. Made 28-of-46 field goal attempts. Second only to Wilt for single-game scoring. Will he ever top this one? How about 90? Something to shoot for. Ruben Patterson, Blazers forward: Not that hideous a night (six points, three turnovers in 95-89 loss to the Mavs), but it is only right and fitting on this historic Sunday that the "Kobe-stopper" get his due. "I couldn't even dream of this when I was a kid. There was no way possible." When news of Kobe Bryant's 81 against the Raptors spread through the Rose Garden's visiting locker room, the Mavericks' relief over outlasting the Blazers in overtime was replaced by amazement at Bryant's feat. Amazement, but by no means shock. That's because the Mavs saw Kobe score 62 on them just a month ago in 33 minutes of a 112-90 Lakers' rout. Mavs guard Darrell Armstrong stabbed his finger at a partial box score showing Kobe had 41 midway through the third quarter against Toronto. "Imagine if our game had been close," Armstrong said, suggesting that had Bryant not sat the entire fourth quarter he might've had more than 81 that night. More than anything, the Mavs were simply curious how Kobe put together the second highest scoring effort in NBA history, eclipsing all except Wilt Chamberlain's 100-point game for Philadelphia against the Knicks in 1962. Only coach Avery Johnson showed more interest in the Sonics' 152-149 double overtime win over the Suns, perhaps because the Mavs play in Seattle on Thursday. But while Johnson marveled at the Sonics winning despite only 40 points in the paint and Luke Ridnour getting 30, the rest of the team looked to dissect Bryant's performance. "How many times did he get to the line?" asked Jerry Stackhouse (a relatively modest 18-of-20). "How many assists?" asked Keith Van Horn. "He didn't have any against us" (two assists, three turnovers). "He took 47 shots?" asked Devin Harris (actually, 46, making 28). Someone asked Dirk Nowitzki if he could top 82. "I don't think that would be good from a team standpoint," Nowitzki said. Stackhouse finished buttoning his shirt and shook his head in pure admiration. "You'd think the Super Bowl would lead 'SportsCenter' tonight," he said. "But you know it won't. It can't. Kobe will. He has to." The Suns scored 149 points but lost in double overtime to the Sonics on Sunday night, when Ray Allen hit a 35-footer at the buzzer to give Seattle a three-point win. The last team to score as many as 149 points and lose was the Nuggets, in a 161-153 regulation-time defeat at San Antonio in 1990. It was Phoenix's fourth loss this season in a game of two or more overtimes, an all-time NBA record. Nine teams lost three such games, most recently the Clippers last season. If Kings forward Peja Stojakovic were to be traded in midseason, the team that acquired him would also acquire his Larry Bird rights, allowing them to exceed the cap next summer to retain him. Stojakovic was involved in early speculation regarding a Ron Artest deal, but that talk was quickly dismissed by the Kings as baseless. If Sacramento were willing to reconsider, a Stojakovic-Artest trade would still seem to make sense for both teams -- provided the Pacers were confident they could keep Stojakovic after his contract expires. "I've heard speculation, rumors going around, but it's something we players cannot control," Stojakovic said. "They're going to do what they wish to do. I'm OK right now. We'll see what's going to happen by the trade deadline. I'm not sure with our front office, what changes or not they're going to do."